Large areas of fire-killed trees are ready fuel when another fire occurs, so removing some large dead wood may reduce potential fuel load. The harvesting equipment used in post-fire logging disturbs forest soils, however, frequently results in soil compaction, soil pore size reduction, and decreases oxygen availability and water and nutrient movement to tree roots. The effects of this mechanical disturbance on soil productivity and forest recovery differ in terms of severity, the amount of time since the disturbance, and site factors. To alleviate compaction, the practice of subsoiling or deep tillage is used to fracture the lower soil strata—but a tradeoff exists—tillage may degrade soil structure and adversely affect microbial biomass and diversity. 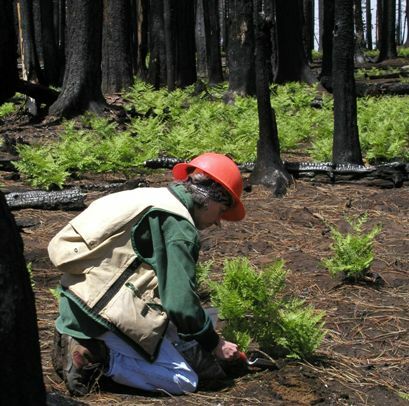 This short-term study was developed to fine tune post-fire treatments that shorten the forest recovery process. Scientists found that soil bacteria and fungi that are essential to mediating decomposition and nutrient cycling appear resilient to timber harvesting applications, but the process reduces the nutrients that are critical to soil productivity. This information will contribute to the success of recovery projects on fire sites in dry, mixed-conifer forests with volcanic soils.